Der T71 DA ist ein amerikanischer leichter Panzer der Stufe 7. Leichter Versuchs-Luftlandepanzer mit Wiegeturm und Ladeautomatik. Von 1952 bis 1953 bei Detroit Arsenal als Ersatz für den M41 entwickelt. Die Bewaffnung wurde als ineffizient angesehen und das Projekt daher aufgegeben. Es wurde nur ein Holzprototyp gebaut. Der T71 DA führt zum T69. 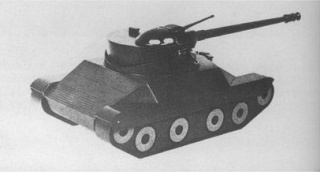 The pike-nose style armor can sometimes even bounce 155mm rounds. 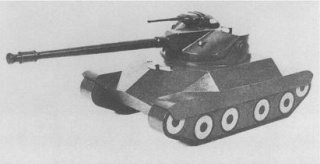 In-game, it possess similar properties to the French AMX series of light tanks excepted the camo who is lower (14/14 vs 18/18). The pacing between shots is 2 seconds on both guns in a 6-round revolver magazine. It has good dynamics, but care should be taken to avoid being hit in the hull, as the engine is especially weak when stock and is destroyed easily. The gun is decent to good for its tier, with 900 potential burst damage over 10 seconds. 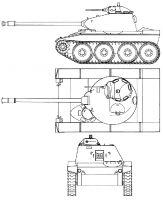 175 penetration is acceptable given the light tank chassis, which encourages flank and rear shots. As with the French tanks, the best combat strategy is to flank a distracted enemy and unload as many of your rounds into their weak areas as you can without taking damage, then withdrawing to repeat on other targets of opportunity. Special attention should be given to one-shot targets, as the T71 can kill several weak tanks very quickly given the chance. 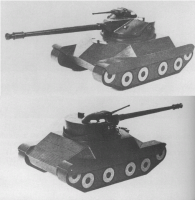 Because of its great turning and top speed it can also circle tanks with slow-turning turrets, leaving them entirely defenseless. This should only be attempted on isolated tanks, however. The upgraded engine gives you an additional 60 horse power and more than double amount of module hitpoints. Diese Seite wurde zuletzt am 25. Oktober 2016 um 14:29 Uhr geändert.